workflow ⋆ 100% Private Proxies - Fast, Anonymous, Quality, Unlimited USA Private Proxy! Is there any solution ! I am creating a list to use as a queue. I am wondering if there is a way to write a workflow that would notify a user when they person ahead of them in the list has completed their item? When working on a workflow in SP Designer 2010 I’ve got a specific user that shows up as having two different domain accounts. Both display the same name but clicking each of them shows a different account such as: DOMAIN\admin_dsmith and DOMAIN\dsmith. How can I remove one of the accounts? If I do a search from the site using the people picker, only one of the accounts shows. Also, when I go into the Central Admin / User Profiles and search I can only find one. Where is the Designer workflow editor getting the duplicate names from? Is there any way I can remove on of them? I have created a list in SharePoint and on the list I have a column for “receiving date”. I need to have a workflow to send an email 15 days after the receiving date. 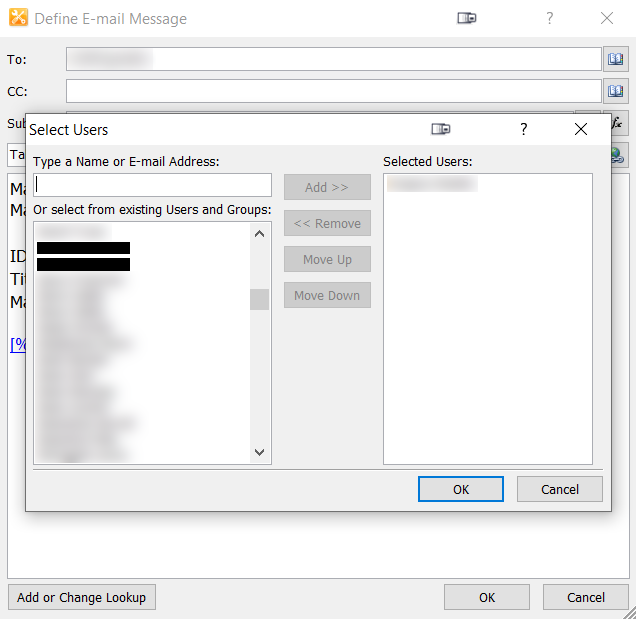 How to Send email reminder to Assignee’s every Sunday if Item status In-progress or not started Using Nintex Workflow 2013? First of all thank you so much for all the help & guidance provided in these communities. It is really very helpful for beginner kind of me. I’m totally new in Nintex Workflow development please help me and share some step by step logic blog/link how to achieve this task. Here is my business logic. We want scheduler alert email notification to all task assignee’s for weekly (start every Sunday in the morning). We have a SharePoint 2013 on-perm custom list, based on the item status in-progress or not started. we want this reminder until the task status will not change is completed. I have document library in SharePoint 2013 environment, content approval is on. and I have copied the default SharePoint 2010 approval workflow and added one action to update the custom approver field once approval task is approved. For first time if approver approves the task the WF will successfully update the approver field and the document gets its major version. When user tries to update the approved document and again requests for approval, this time when approver approves the task, the workflow through below error with with outcome as unknown error. the document continues to be in pending sate ever. Please help me on this.Thanks. I have a workflow which is set to manual start in SharePoint 2013. What it does is it populate fields in another list that I made when the workflow starts. The workflow gets data from the calendar list (Start time, Meeting name etc.) and the person’s user name. However, I need to also get the user’s mobile number and employee number which needs to be entered by the user manually since it’s not part of their user info. I’m trying to capture this information using the initiation form that is attached to the workflow by connecting the initiation form to the list by editing it through InfoPath. I tried several walkthroughs that I found online but none of them works. Can someone please help me and point me to the right direction.